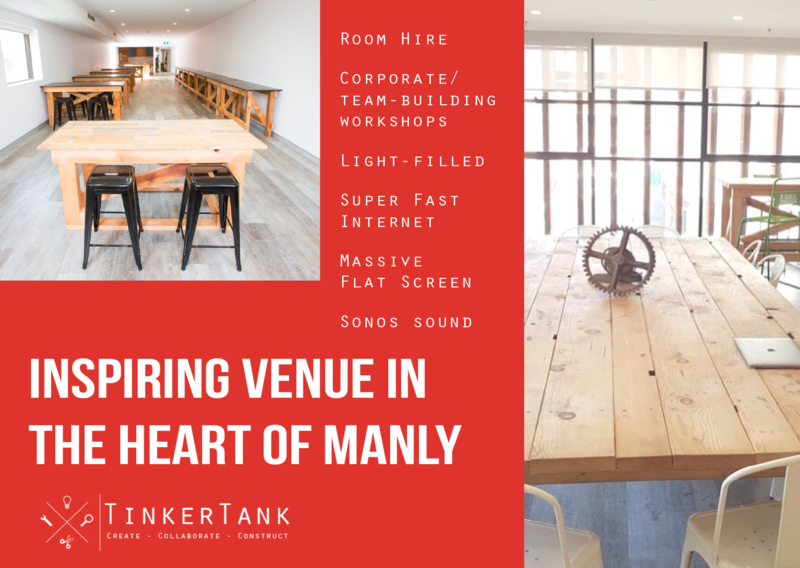 TinkerTank is a unique meeting space in the heart of Manly, on the Corso. With modern workshop-type furniture, quality light fittings, high ceilings, abundance of natural light and Some of the best restaurants and coffee shops in the northern beaches, just out side your door.– it’s the perfect destination for your next meeting. THE MOST UNIQUE PLACE IN SYDNEY TO INSPIRE AND MOTIVATE YOUR TEAM. The feeling you get when you enter our space is unique and inspiring. If you’re coming from the city, arriving by the Manly Fast Ferry is great. There are ferries from/to Manly via Circular Quay, Darling Harbour, North Sydney and Pyrmont Bay. Click here for timetables. ALSO - WE HAVE TEAM BUILDING WORKSHOPS, AVAILABLE! Going out before or after your meeting? We’re just across the road from Manly Wharf which boasts a selection of fine dining to include, Manly Wharf Bar, The Lumberjack Co., Bavarian Beir Garten, and Hugo’s. We can also arrange catering. Yum!